Companies pursue innovation with the best of intentions. But all too often, theses efforts quickly lose steam. We’ve all been there—someone pitches an idea, and it’s met with enthusiasm. Everyone is excited! The company wants to evolve; the company needs to evolve. A plan is quickly put in place to turn this fresh idea into reality. But, well, then the company starts acting like a company again. Over time, the idea loses all its momentum until it’s no longer the shiny, innovative idea it started as. It gets dialed back again and again until it’s completely unrecognizable, and it dies a slow, silent death. The company returns to its status quo. I’ve seen this happen over and over, at companies I’ve worked for and companies I’ve worked with. When it comes to innovation, companies fall into the same bad, idea-killing habits over and over again. Don’t let your company be an idea killer. 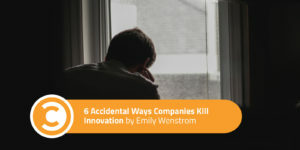 Look out for these six common ways companies talk themselves out of innovation. Research is good. When you pitch a new idea, you better have the data to back it up. But it’s also an easy thing to hide behind—especially these days, when big data makes analytics an utterly bottomless rabbit hole. When you’ve got the key points covered, but leadership is still asking for more and more to analyze, beware: that idea is beginning to drift away, carried by a fear of the risk involved. It all starts out quite reasonably. The big idea your department came up with will affect another department, too. So you pull in someone for input. After all, you’re a team player, right? But then another person is brought in. And another. And another. Suddenly, there are too many cooks in the kitchen. Everyone wants in on the action, and everyone has their own agenda. Your team is left with too many objectives and no clear direction. With so many others trying to turn your project into theirs, how can you possibly make a real impact with any of them? No, no, no. This is always the wrong question. There is a big difference between staying informed about other companies in your sector and looking to them for your own company’s direction. Your competition may be similar to you, but they are not you. Don’t do something simply because your competition is. Don’t avoid something simply because your competition is not doing it. Apply new ideas in a way that is right for your company. If your way is different from your competitor’s approach, that’s not just okay—it’s great. All you need to know is why your approach it’s better for your company. Sure, at the end of the day, ROI is what companies are about. If it doesn’t help the company raise revenue, it’s not serving the company—or its employees. But people who hound this point on a fresh idea are usually looking to eliminate all the risk factors associated with trying something new. Should a project fail to deliver that target ROI from the outset, the ROI assurance-seeker has the ammunition to shut the effort down and a quick finger on the trigger. When you’re trying something new, you’re not likely to nail it on your first stab. Like any project, iteration should be an assumed, ongoing part of implementation. Rather than set a threshold ROI, set a goal ROI to work toward as the project is honed. It’s easy to see where this question comes from, particularly if the innovation involves a new area of services or product offerings. But this mentality is purely reactionary, and that’s a weak position to work from. Instead, be Steve Jobs. It’s not your client’s job to inform the company about the latest trends in the industry. In fact, keeping your client abreast of the latest tools and trends in your industry is your job. So don’t wait for clients to ask—forge ahead and then show clients how this benefits them. This is otherwise known as the dial-back dilemma. This tends to happen when leadership knows they need to try some fresh innovation but are too scared to take the full leap. They’d rather dip a toe in first, rather than take the dive. If you take a big idea and trim it down until it’s just a small fragment of the original, it reaches a point where it can’t make a real impact anymore. Lackluster results are held up to the glimmering potential of the original concept and determined to be a flop. The best way to avoid these innovation pitfalls is to foster a culture of curiosity, creative openness, and forward-thinking adaptability at your company. Even better, establish a regular budget of time and dollars to be reserved for innovative experimentation. To protect against the stigma of failure, reward employees for the simple act of bringing forward fresh, creative ideas, rather than the results. But if making those kinds of sweeping changes aren’t in your control, you can still help to keep a project on track. When you see signs of resistance developing as a new idea is pursued, gently bring attention to it, and try to remind the team of the merits of being daring enough to be visionaries. After all, even if an effort fails, the team will learn a lot in the process, and that wisdom goes right back into company.